3) Customize with your own information. 4) Use the Finish option to complete your new working website. Repeat steps 1-3 in any order, as many times as needed, to make adjustments and instantly preview your website pages. 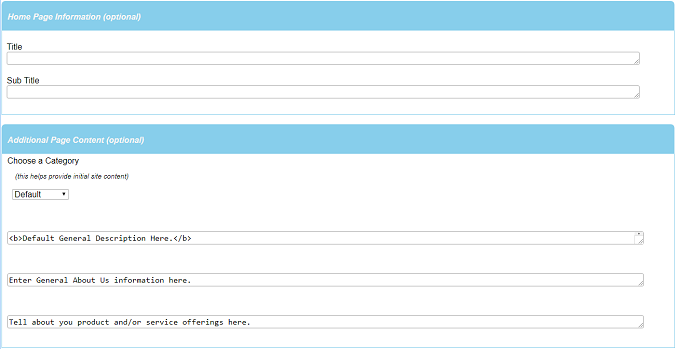 Click on the Templates menu item to show the Template Selection Panel. Use this screen to find a template you like. Click on any template to begin. 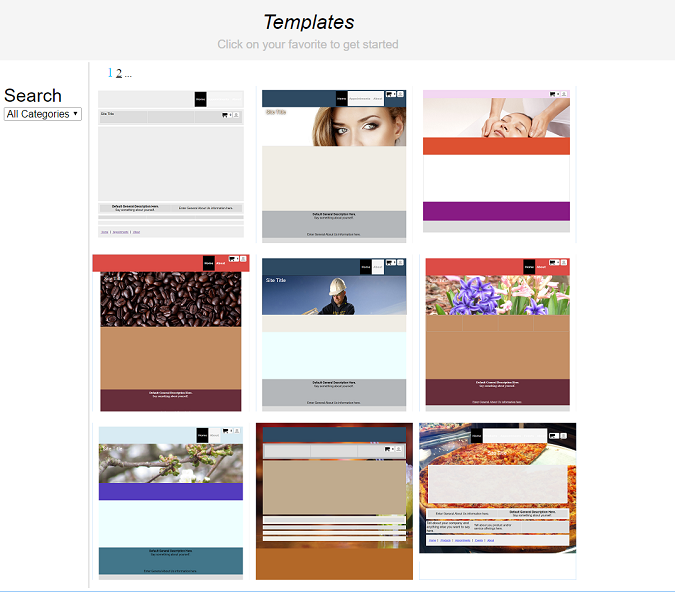 You will be able to change your template selection at any time. 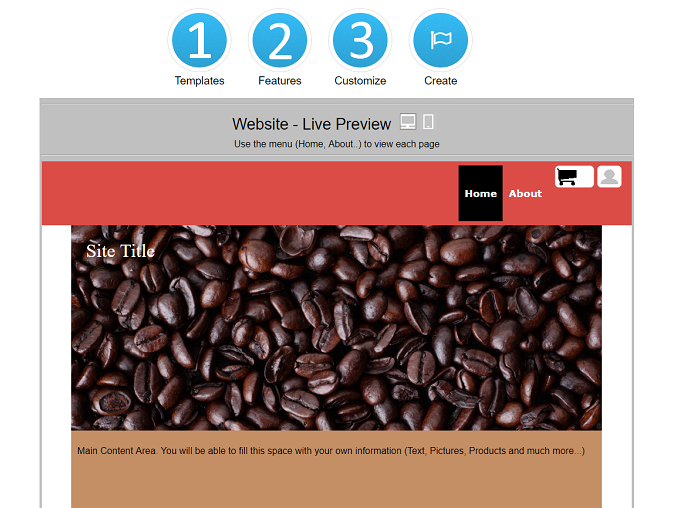 Once you have chosen a template, you will see the Website - Live Preview screen for the Template you have chosen. The Live Preview will update as you proceed though the steps. You may view the pages of your website by clicking on each menu item within the Live Preview ie. Home or About. You may click on the Desktop and Mobile icons to see how your website will appear on each of these devices. Adding features to your website is easy. 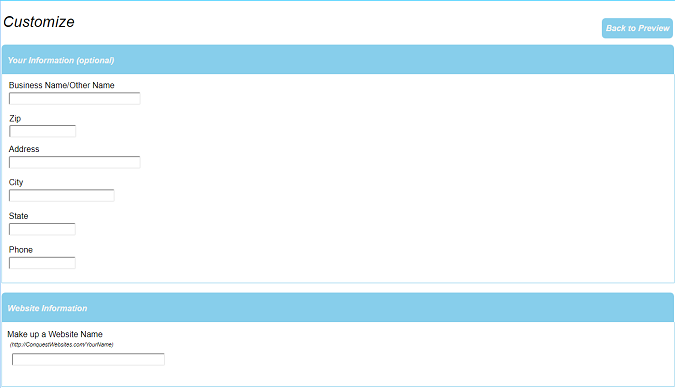 From the Live Preview page, click on the Features icon (2) to choose from the available options. Some of these feature selections will add a new page to your website when chosen: ie. Sell Products, Appointment Scheduling, Event Calendar. When you are done choosing, click the Back to Preview button to see the website updated with your chosen features. View all of your pages using the Live Preview menu ie. Home or About. 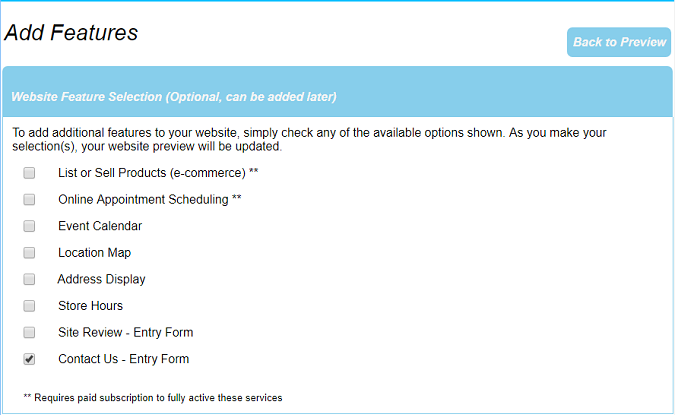 Add your business information and message to your new website using the Customize panel (3). Here, you add your information and your messages to show on your website. Choose a Category so we can help provide some initial wording and content for your site. Click the Back To Preview button once you have entered your information to see the changes updated in the Live Preview. After your website has been created, you will be able to use the Site Content Editor to make any adidtional changes to your site that you want. ** Please note: Website Name is NOT a domain name. Initially, you will be able to access your website using http://The5MinuteWebsite.com/WEBSITENAME. If you have an existing domain name, that can be tied in once the website has been created. To finish creating your website, you must create an account by entering your email address and making up a password. This account will become the administrator that can edit and manage the website. In addition, this e-mail address will receive any site notifications such as when someone uses the Contact Us feature. Click the Create Website button when you have completed this form. Note: Data entered during the build steps will be validated. You must complete all required fields to finish creating your website. Try it NOW, it's easy!